There are a couple videos in the public domain space now where I take credit to have preserved them from fading away. 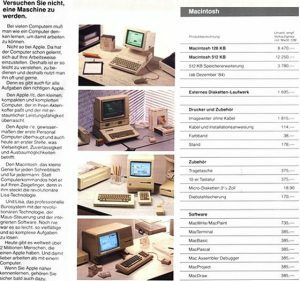 The first is Future Shock by Apple 1988. A decade later I stumbled upon the CD at the library of the IZHD, made a backup copy, and uploaded it to my site. From there it went to Mac Essentials’ magazine site, and eventually to youtube. 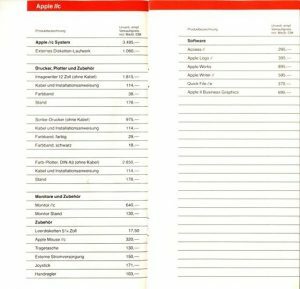 Future Shock, Apple 1988 from mprove. Let’s have Fun. Never take the same elevator with Steve. You do not have a job anymore. q.e.d. Apple does not do Design Thinking. Nonetheless, Apple products are still best of breed. 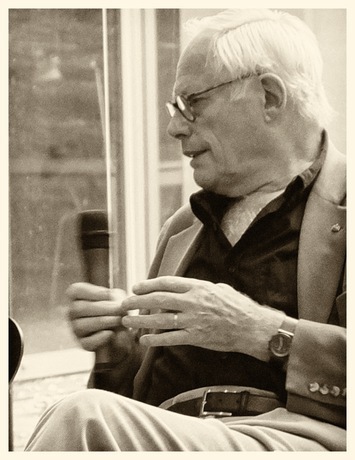 Dieter Rams war vor einiger Zeit zu Gast im Museum für Kunst und Gewerbe Hamburg. Klaus Klemp moderierte die Veranstaltung an der außer Dieter Rams noch “seine Schüler” Olaf Barski und Andreas Hackbarth teil genommen haben. 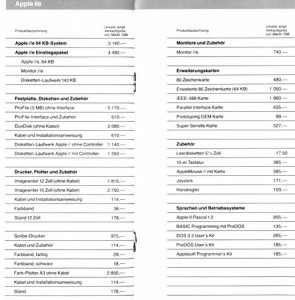 Sie diskutierten über die Voraussetzungen einer guten Design-Ausbildung, über die große Bedeutung der Anwendungsqualität neuer Produkte und den Mangel an Unternehmerpersönlichkeiten, die bereit seien, in die fundierte Entwicklung von Design zu investieren. Ich möchte keine Beschwerden zu der Soundqualität hören – die Originalaufzeichnung war dank der Akustik im Saal kaum zu verstehen. Hier nun die spannenden 74 Minuten. it has been quite a while since our last newsletter. Lot’s of things are happening around us, and we are one of the significant forces to shape the present and future. At least we should! User Experience matters. More than ever. At interaction|12 I had a chat with a next gen PhD student. Well, “next gen” is of course relative to my point in life. He was very enthusiastic about the possibilities of all the new mobile devices. According to him, now is the time to apply design to technology, as opposed to the eighties of the previous century, when engineers built the desktop systems. – Hmm, he was right and wrong. Times are exciting. They have always been. But human factors, software ergonomics, human interface design, usability, information architecture, interaction design, design thinking, service design, user experience, …, are not new at all. It is no surprise that your products, sites, and services are much more successful once you start with the user in the center of the design considerations. Oops, I wanted to write about something else. So please take my preaching above as a preface. Should I tell the story chronologically, or are you already used to think backwards like in blogs, micro-blogs, and activity streams? All the reverse navigation structure really bothers me, because it is the only option. [at this point, imagine the results of a design workshop about alternative visualizations of time based content.] I will tell the story the old fashioned way. Once upon a time… :o) I bought an mp3 player in the US; in fact I ordered it to be delivered to a friend in San Francisco. Later Jo told me the story how the FedEx guy presented the package to him, “Hello! Your new Apple iPod Nano has arrived! !” Isn’t it astounding that even unrelated employees spread the joy about certain products? Years later, and a few months ago, Apple informed me that my Nano could catch fire, and they offered another Nano in exchange. This is bitter & sweet, because the product design of the first generation Nano, and the story how the device came into my possession made it so special that I did not want to send it back to Apple. – I did it anyway and received the latest model in return. I still do not like it very much. Though, I can listen to FM radio and connect it with my sneakers!? Just one new feature is the reason for me not to abandon the Nano and get an original Nano back from eBay: I discovered Voice Memo. But it I took me a while until I figured out that a microphone has to be connected to the jack for the ear phones to start recording. I rarely talk to myself – and thinking-aloud should be reserved for other situations. Instead I record sessions from our local UX community in Hamburg with the intend to publish a podcast. Again, this sounds easier than it was. OK, a podcast is basically an RSS feed with links to the episodes. Now what? How to prepare the audio files in an appropriate quality? Where to store the files? How to create the feed? I found a few good tutorials online, and looked behind the curtain of other podcasts like the BayCHI Podcasts, The LongNow Seminars, Jan ‘s IATV Radio, and Tobi’s Einschlafen Podcast. And here it is [drum roll] the uxHH Radio at uxhh-radio.blogspot.de. Darius Kumana, ThoughtWorks, London, about Getting Beyond Good Enough – the marriage between agile and UX. Previous episodes are taken from HyperKult in Lüneburg and my Raum Schiff Erde unconferences in Hamburg. I might add other (bootleg) recordings as well, but I will stick to UX in the Northern part of Germany. I hope you tune in and find inspiration by one of the podcasts mentioned above. Or let us know your favorite channel. Sir Jonathan Ive, Jony to his friends, is arguably one of the world‘s most influential Londoners. The 45-year-old was born in Chingford — and went to the same school as David Beckham. He met his wife, Heather Pegg, while in secondary school. They married in 1987, have twin sons and now live in San Francisco. As Apple‘s Senior Vice President of Industrial Design, he is the driving force behind the firm‘s products, from the Mac computer to the iPod, iPhone and, most recently the iPad. He spoke exclusively to the Evening Standard at the firm‘s Cupertino headquarters. A: I was absolutely thrilled, and at the same time completely humbled. I am very aware that I‘m the product of growing up in England, and the tradition of designing and making, of England industrialising first. The emphasis and value on ideas and original thinking is an innate part of British culture, and in many ways, that describes the traditions of design. Is London still an important city for design? I left London in 1992, but I‘m there 3-4 times a year, and love visiting. It‘s a very important city, and makes a significant contribution to design, to creating something new where previously something didn‘t exist. How does London differ from Silicon Valley? The proximity of different creative industries and London is remarkable, and is in many ways unique. I think that has led to a very different feel to Silicon Valley. What I enjoy about being here is there is a remarkable optimism, and an attitude to try out and explore ideas without the fear of failure. There is a very simple and practical sense that a couple of people have an idea and decide to form a company to do it. I like that very practical and straightforward approach. There‘s not a sense of looking to generate money, its about having an idea and doing it – I think that characterises this area and its focus. What makes design different at Apple? We struggle with the right words to describe the design process at† Apple, but it is very much about designing and prototyping and making. When you separate those, I think the final result suffers. If something is going to be better, it is new, and if it‘s new you are confronting problems and challenges you don‘t have references for. To solve and address those requires a remarkable focus. There‘s a sense of being inquisitive and optimistic, and you don‘t see those in combination very often. How does a new product come about at Apple? What I love about the creative process, and this may sound naive, but it is this idea that one day there is no idea, and no solution, but then the next day there is an idea. I find that incredibly exciting and conceptually actually remarkable. The nature of having ideas and creativity is incredibly inspiring. There is an idea which is solitary, fragile and tentative and doesn‘t have form. What we‘ve found here is that it then becomes a conversation, although remains very fragile. When you see the most dramatic shift is when you transition from an abstract idea to a slightly more material conversation. But when you made a 3D model, however crude, you bring form to a nebulous idea, and everything changes – the entire process shifts. It galvanises and brings focus from a broad group of people. It‘s a remarkable process. It is so important to be light on your feet, inquisitive and interested in being wrong. You have that† wonderful fascination with the what if questions, but you also need absolute focus and a keen insight into the context and what is important – that is really terribly important. Its about contradictions you have to navigate. What are your goals when setting out to build a new product? Our goals are very simple – to design and make better products. If we can‘t make something that is better, we won‘t do it. Why has Apple‘s competition struggled to do that? That’s quite unusual, most of our competitors are interesting in doing something different, or want to appear new – I think those are completely the wrong goals. A product has to be genuinely better. This requires real discipline, and that‘s what drives us – a sincere, genuine appetite to do something that is better. Committees just don‘t work, and it‘s not about price, schedule or a bizarre marketing goal to appear different – they are corporate goals with scant regard for people who use the product. When did you first become aware of the importance of designers? 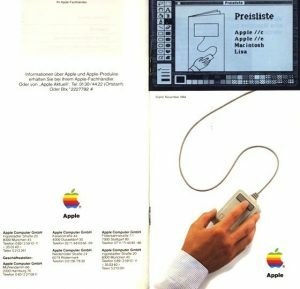 First time I was aware of this sense of the group of people who made something was when I first used a Mac – I‘d gone through college in the 80s using a computer and had a horrid experience. Then I discovered the mac, it was such a dramatic moment and I remember it so clearly – there was a real sense of the people who made it. When you are coming up with product ideas such as the iPod, do you try to solve a problem? There are different approaches – sometimes things can irritate you so you become aware of a problem, which is a very pragmatic approach and the least challenging. What is more difficult is when you are intrigued by an opportunity. That, I think, really exercises the skills of a designer. It‘s not a problem you‘re aware or, nobody has articulated a need. But you start asking questions, what if we do this, combine it with that, would that be useful? This creates opportunities that could replace entire categories of device, rather than tactically responding to an individual problem. That‘s the real challenge, and that‘s what is exciting. Has that led to new products within Apple? Examples are products like the iPhone, iPod and iPad. That fanatical attention to detail and coming across a problem and being determined to solve it is critically important – that defines your minute by minute, day by day experience. How to you know consumers will want your products? We don‘t do focus groups – that is the job of the designer. It‘s unfair to ask people who don‘t have a sense of the opportunities of tomorrow from the context of today to design. Your team of designers is very small – is that the key to its success? The way we work at Apple is that the complexity of these products really makes it critical to work collaboratively, with different areas of expertise. I think that‘s one of the things about my job I enjoy the most. I work with silicon designers, electronic and mechanical engineers, and I think you would struggle to determine who does what when we get together. We‘re located together, we share the same goal, have exactly the same preoccupation with making great products. One of the other things that enables this is that we‘ve been doing this together for many years – there is a collective confidence when you are facing a seemingly insurmoutable challenge, and there were multiple times on the iPhone or ipad where we have to think ëwill this work‘ we simply didn‘t have points of reference. Is it easy to get sidetracked by tiny details on a project? When you‘re trying to solve a problem on a new product type, you become completely focused on problems that seem a number of steps removed from the main product. That problem solving can appear a little abstract, and it is easy to lose sight of the product. I think that is where having years and years of experience gives you that confidence that if you keep pushing, you‘ll get there. Can this obsession with detail get out of control? It‘s incredibly time consuming, you can spent months and months and months on a tiny detail – but unless you solve that tiny problem, you can‘t solve this other, fundamental product. How do you know you‘ve succeeded? It‘s a very strange thing for a designer to say, but one of the things that really irritates me in products is when I‘m aware of designers wagging their tails in my face. Our goal is simple objects, objects that you can‘t imagine any other way. Simplicity is not the absence of clutter. Get it right, and you become closer and more focused on the object. For instance, the iPhoto app we created for the new iPad, it completely consumes you and you forget you are using an iPad. What are the biggest challenges in constantly innovating? For as long as we‘ve been doing this, I am still surprised how difficult it is to do this, but you know exactly when you‘re there – it can be the smallest shift, and suddenly transforms the object, without any contrivance. Some of the problem solving in the iPad is really quite remarkable, there is this danger you want to communicate this to people. I think that is a fantastic irony, how oblivious people are to the acrobatics we‘ve performed to solve a problem – but that‘s our job, and I think people know there is tremendous care behind the finished product. Do consumers really care about good design? One of the things we‘ve really learnt over the last 20 years is that while people would often struggle to articulate why they like something – as consumers we are incredibly discerning, we sense where has been great care in the design, and when there is cynicism and greed. It‘s one of the thing we‘ve found really encouraging. Users have become incredibly attached, almost obsessively so, to Apple‘s products – why is this? It sound so obvious, but I remember being shocked to use a Mac, and somehow have this sense I was having a keen awareness of the people and values of those who made it. I think that people‘s emotional connection to our products is that they sense our care, and the amount of work that has gone into creating it.